What Happens During Arizona Monsoon? Monsoon is a weather condition that is actually defined as a season. In Arizona, monsoon storms are typically experienced during the summer. Humidity levels increase, and the season is marked by wind storms, dust storms, and periods of heavy desert rains. 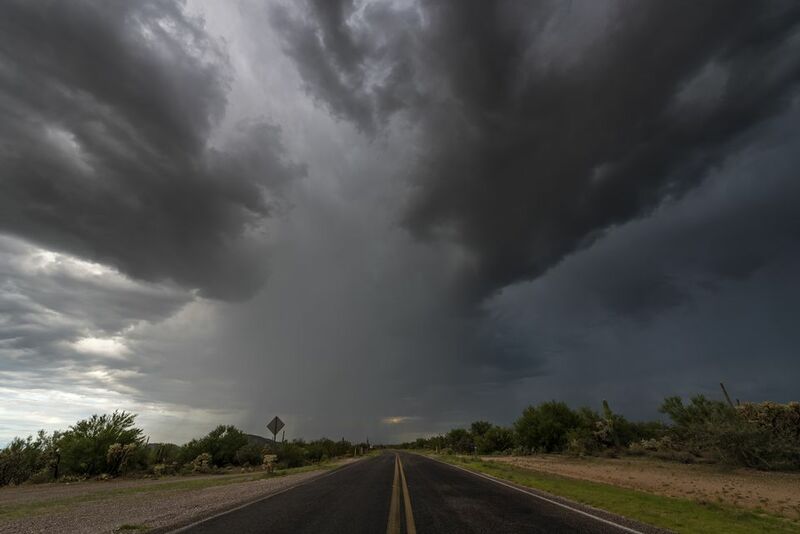 Having information about this season of unsettled weather will help residents and visitors understand Arizona's monsoon and to take steps to be safe during monsoon activity. The monsoon rains can be welcome but sometimes dangerous. Flooding and wind damage can occur. In Arizona, as in other regions of the world including India and Thailand, monsoon is a season of high temperatures, high winds, and high moisture, resulting in potentially deadly weather. The National Weather Service has set June 15 as the first day and September 30 as the last day of Arizona's monsoon season. Knowing this range of dates allows visitors and residents to be prepared for the strong weather systems during monsoon. Dangerous conditions can appear suddenly. A severe storm may spawn a microburst, but more often high winds, dust, and severe downpours result in flash floods. Tornadoes are relatively uncommon in Arizona, but during the monsoon, there are times when people will report tornado-type activity. If you experience damaging, sometimes rotating winds with debris being scattered it is more likely that the phenomenon is a microburst. This type of quick-hitting storm is part of the monsoon season. It's an unusual name, and it can be amazing to watch, but it is dangerous if you get caught driving or walking in one. A The name comes from the Arabic word habb, meaning “wind.” A haboob is a wall of dust that is a result of a downburst where air is forced downward and pushed forward by the front of a thunderstorm cell, picking up dust as it travels across the terrain. All over Arizona, you will see dry riverbeds called washes. During monsoon season these washes can fill with water very suddenly. In fact, it may not even be raining where you are for a wash to fill with water. The rainstorm may be happening upstream from you. This flash flooding happens during the monsoon and so cars, people and even cattle can become stranded or swept away. During the summer monsoon when there's lots of water either standing or flowing across roads and through washes. It is very important to avoid driving through these flooded areas. You might think that the only serious weather issues in the Phoenix area are the temperatures. You'll know differently after you have experienced your first monsoon storm. They can be dangerous, and safety rules are specific to the type of storm. For example, if you are driving and enter a dust storm, or haboob, pull off the road and turn your lights off to wait until it has passed. During the monsoon when flash flooding can occur, avoid entering water flowing over the road. These ​phenomena are temporary during storms but require extreme caution. Life in the desert can be harsh, and the unique weather patterns and the storm-producing monsoons are something to consider when visiting during the summer. The high temperatures of that season can bring different types of storms, some dangerous. Which is why photos of Phoenix area dust storms and monsoon storms can be both intriguing and scary. When summer storms come around, all that wind, dust and rain can cause damage to a home. Beware of scam artists looking to take advantage of the homeowners' distress by offering cheap home repairs or landscape work after a monsoon storm. It's important to get several bids and the lowest, especially if it is much lower than the others, may indicate a scam. Be sure and check that the business is properly licensed and in good standing before accepting their bid.